The OwnerRez Channel Bridge is a Chrome browser extension that allows you to log in to your listing site accounts and unlock the data stored there, rather than relying on the limited export functionality that the listing site offers. With Channel Bridge, you'll be able to download your data and upload it directly into OwnerRez in one smooth operation. 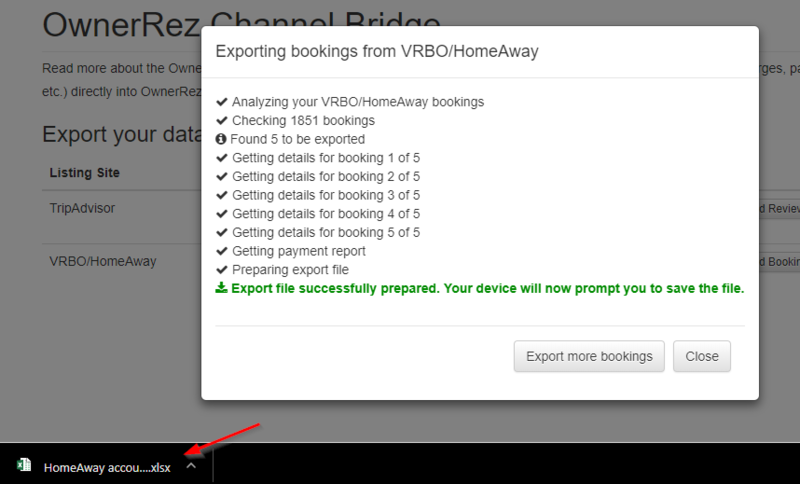 We've had imports from VRBO/HomeAway payment and reservation exports and Airbnb Transaction History exports for awhile, but Channel Bridge is much better because it downloads all of the data in one operation and includes many things missing from their exports like charges and pet info. 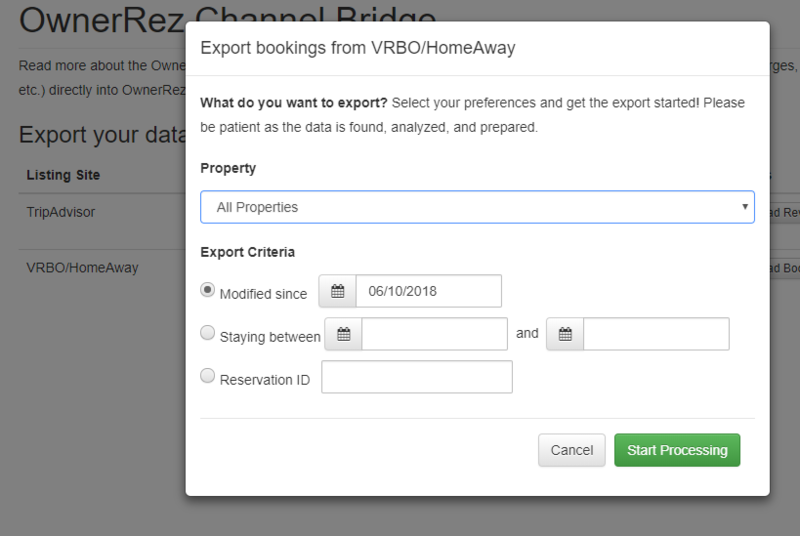 This article will cover how to download your bookings from VRBO/HomeAway or Airbnb (including contact info, guest counts, charges, and transactions) and upload them into OwnerRez. You can also download TripAdvisor reviews which works the same way as our Vacation Rental Tools extension -- read more about reviews on the Vacation Rental Tools Review article. That's it! You're ready to download bookings into OwnerRez. First, click the Channel Bridge icon in your Chrome browser. It'll have the OwnerRez palm tree icon. That'll bring up a screen where you can connect to your channel accounts. If you're already logged in, you're good to go. If not, the Channel Bridge will detect that and show that you are disconnected and provide a "Log In" button to the VRBO/HomeAway or Airbnb login page. Just login as you normally do and then come back to the extension. Once you're logged in, Channel Bridge will show that and offer a button to Download Bookings. Click the Download Bookings button to get started. That will pop up a dialog that lets you choose which properties and bookings to download. Staying Between - This option lets you enter a start date and end date and download all bookings that stay between those dates. This is useful for initial setup where you want to download a larger chunk of bookings, or when you want to update a specific subset of bookings. Reservation ID - This option lets you enter a specific reservation ID (like HA-AB2CD3) and download just that booking. Useful when you know a specific booking has just changed and you only want to update that one booking. Once you've selected your criteria, hit the Start Processing button and the Channel Bridge will find the matching bookings, download the reservation info, the charges, and all transactions related to the booking. It will crunch that all together and download an export file to your machine. This may take awhile if you are getting hundreds of bookings, so for initial loads we recommend doing several smaller exports of a few months at a time. Occasionally an error may occur during the process -- sometimes a booking download will fail temporarily. If that happens, try again and see if it goes through. If not, contact us and we'll sort it out. After the file is prepared and downloaded, you're ready to upload it into OwnerRez and update your bookings! If you want to review the file first, you can open it in Excel and see all of the data that was downloaded. Go to the Import bookings from OwnerRez Channel Bridge section in the Tools > Import/Export area. If you haven't yet enabled the channels module, it will prompt you to enable it. Do that, then go back to the Import bookings from OwnerRez Channel Bridge section. Select the file you just added click the Import button. The channel bridge import will detect which channel the download came from and handle it. This will upload the data into OwnerRez and merge with any existing bookings created by Calendar Imports. Once the import is complete, you'll get a results page detailing all of the bookings that were imported and the transactions added to them. Review the bookings and check for any issues. If there is a negative balance on a booking, that is likely because you recorded a payment in OwnerRez with a different date than the one in the download file. To fix that, you can set payments to Overwrite mode so the existing payment will be removed and all payment data will be filled from the download file. If OwnerRez can't process the file, or merging the charges/transactions would overwrite existing data not created by the Channel Bridge (for example, if you manually recorded a payment or processed charges for incidentals in OwnerRez), you'll get an error detailing the reason. Some resolutions for common issues are below. You can also open the download file and delete the entire row for the booking on the Bookings tab and then save the download file and select the new file -- that will exclude that booking from being imported. The import is done in a safe way so that it will all either succeed or any changes will not be applied -- you'll never get any partially applied changes if an error occurs. So if you do have an error, the import will tell you what's wrong and you can fix it, remove the booking from the file, or set a skip/overwrite option and then run the upload again. Some items may be skipped based on your settings -- if anything is skipped, that won't cause a true error as long as everything else is successful, but review the skipped items to ensure that the bookings you expected to be updated were updated. If you didn't want them to be skipped, switch to Overwrite mode instead of Merge mode. "Must be a valid Excel xlsx formatted file" or "Couldn't match columns to standard template" or "Couldn't find worksheet" -- Make sure you're selecting the correct download file from the Channel Bridge extension and you haven't changed the file layout. You can delete rows to remove bookings, but don't rename columns or worksheets or move them around. "Couldn't find property by Listing Number or Property Name" -- We attempt to match properties by property name, but often the names are different in OwnerRez vs. the channel. To fix this, go to Settings > Channels, open the synced channel (or create a new one if there is none yet) Property Settings tab. Enter the listing numbers for each property there -- just the numeric portion of the number like 123456 -- not any ha suffix or URL. If you have multiple listing numbers for a single property, you can enter them all, separated with commas. "Couldn't merge new charges because the existing booking charges have been manually changed" -- The default options to merge with existing charges and transactions will work if you haven't already recorded charges or payments against the booking manually or using the channel payments/transactions import. If you have charges that are different than the ones coming in from the channel, you'll get an error in Merge mode to ensure that you know about the situation. To fix this, change the mode to either Skip or Overwrite. Skip will skip any bookings that have different charge amounts in OwnerRez and process the rest. Overwrite will overwrite the charge amounts in OwnerRez from the ones in the download file. If you run into an error you can't resolve, contact us and we'll help you out.